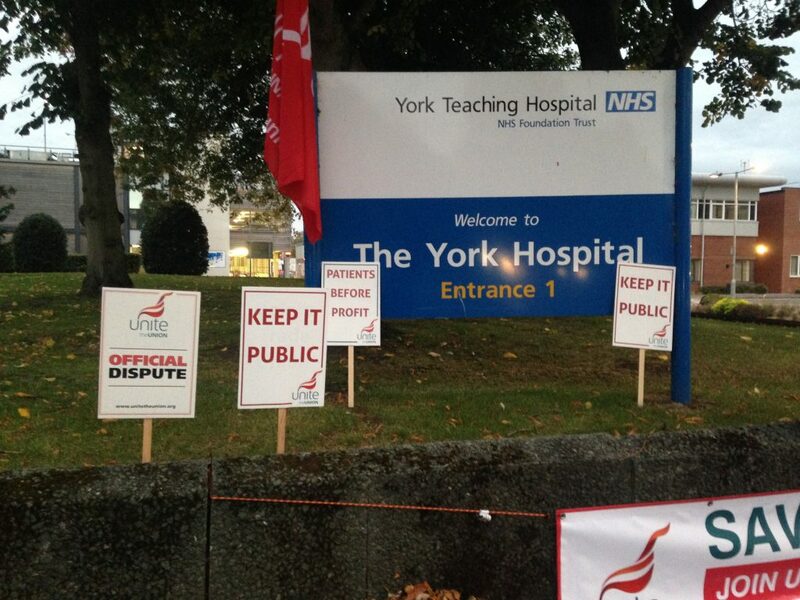 The fight against NHS privatisation goes on as maintenance and estates staff at both York Teaching Hospital NHS Foundation Trust and East Kent Hospitals University NHS Foundation Trust have gone on strike this week against the decision to transfer them to wholly owned subsidiaries. More than 50 estates members from the trust in East Kent (pictured above and below) downed tools from midnight on Monday (September 24). Their strike action will continue until 11.59pm on Friday (September 27). 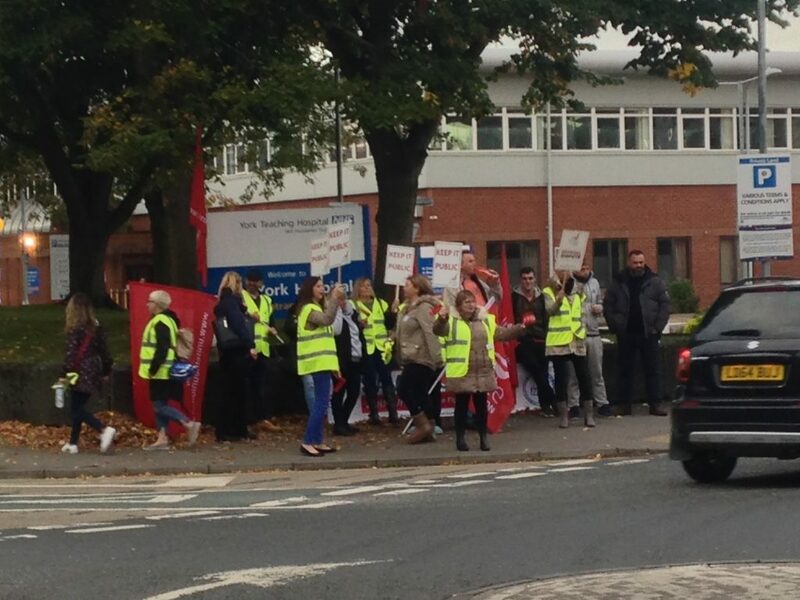 More than 200 estates and maintenace staff working for York Teaching Hospital (pictured below) began strike action from 6am today (September 27) and intend to carry on until Saturday, September 29 at 5.59am. Like their sisters and brothers working at the East Kent trust, striking York Teaching Hospital trust staff (pictured below) are angry that they face being transferred to a wholly owned subsidiary — a private arms-length company set up, owned and run by individual trusts. Setting up subsidiaries has stoked fears over possible ‘Carillion-style’ meltdowns that could lead to job losses and the ‘salami-slicing’ of service provision. Evidence has shown that when staff are transferred to wholly owned subsidiaries, new employees are not given access to the NHS pension scheme and are offered inferior Agenda for Change terms and conditions. 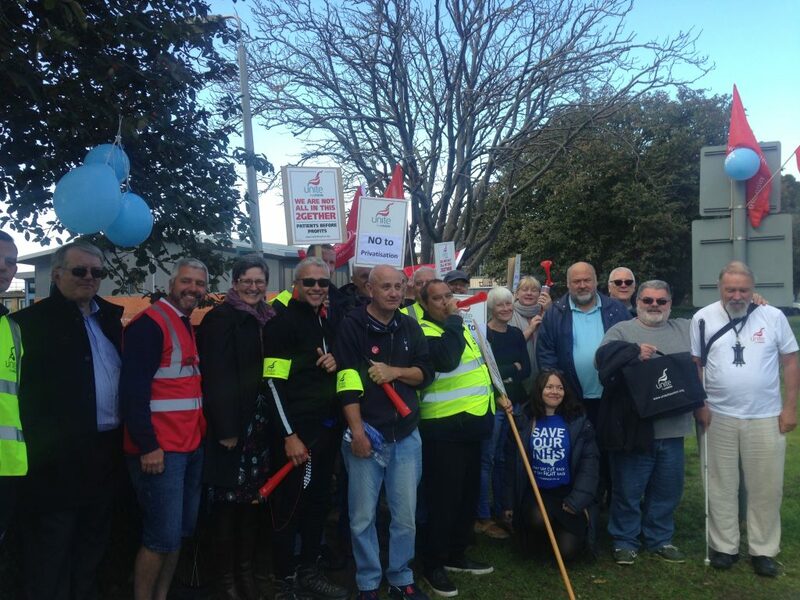 Striking workers at both trusts have garnered support from across their communities, including from Unite Community branches, and beyond. 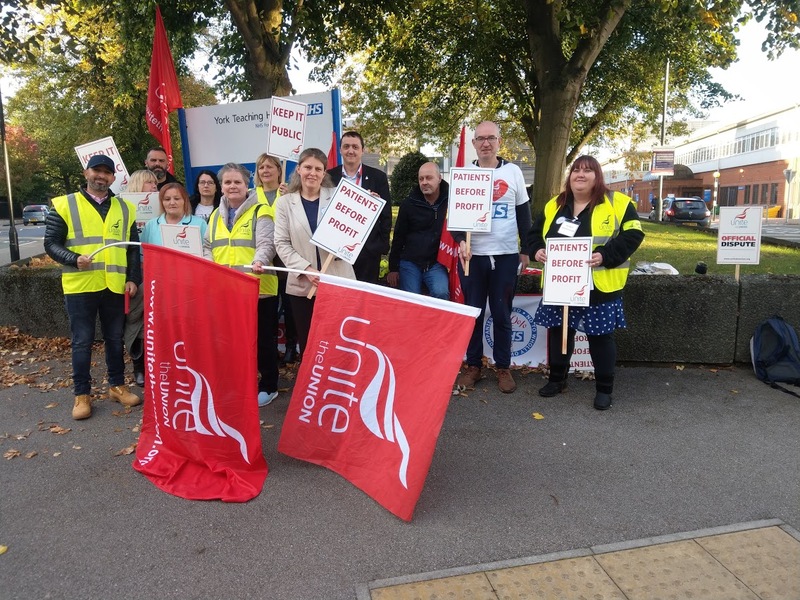 Labour MP for York Central Rachael Maskell (pictured below) joined York Teaching Hospital staff on the picket lines this morning (September 27). 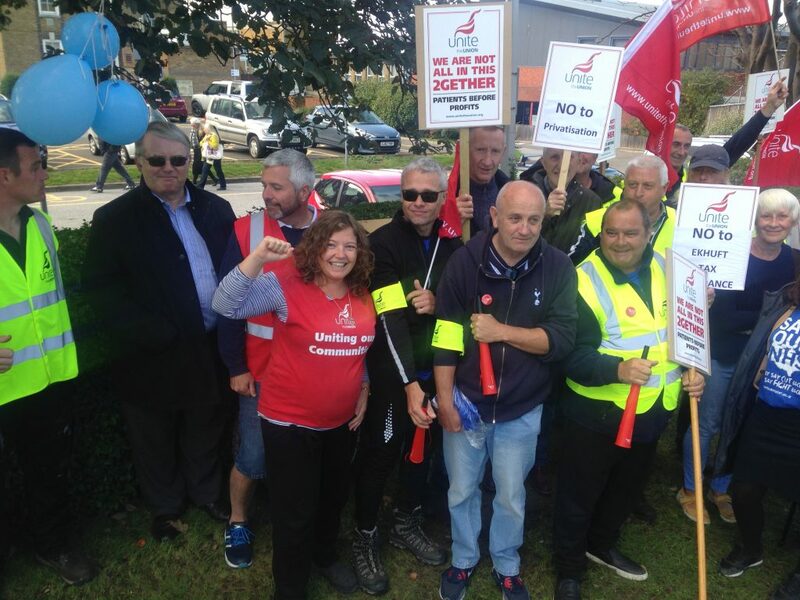 The issue of wholly owned subsidiaries — which Unite is fighting against industrially, politically and through community campaigning — made a big splash at this year’s Labour Party Conference this week. 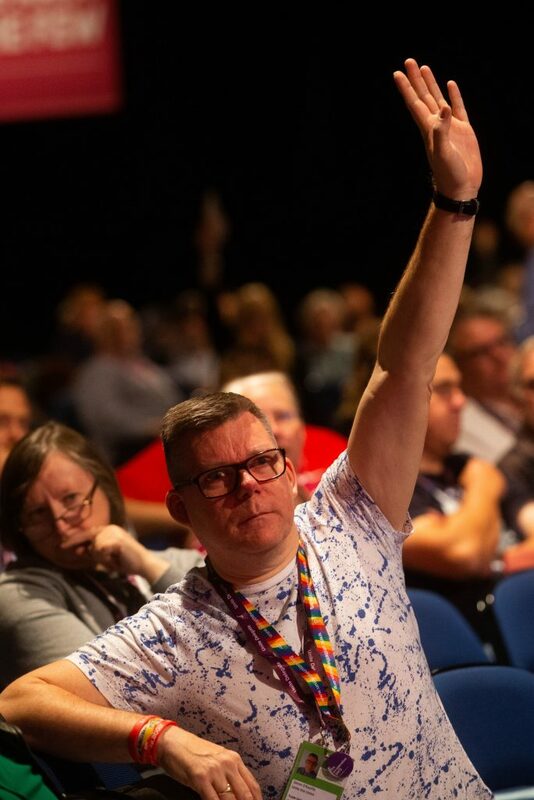 Unite delegate Simon O’Keefe (pictured below) warned conference about the dangers of wholly owned subsidiaries creeping into the NHS. 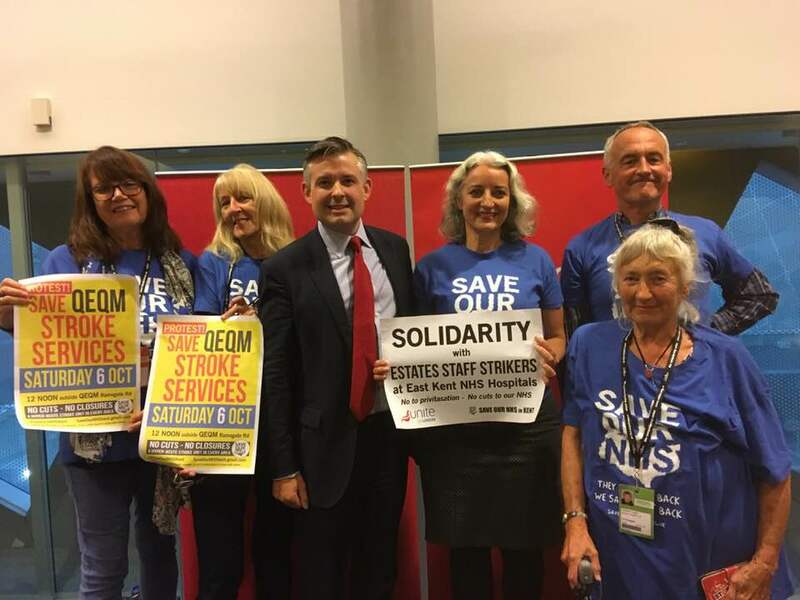 Labour’s shadow health and social care secretary Jon Ashworth joined NHS campaigners and South Thanet PPC Rebecca Gordon-Nesbitt (pictured below) as he pledged his support for the striking workers. In his address to conference, Ashworth said, “The next Labour government will end privatisation, will end PFI, we will repeal the Health and Social Care Act and yes will bring forward reinstatement legislation as we begin the process of renationalising our National Health Service. 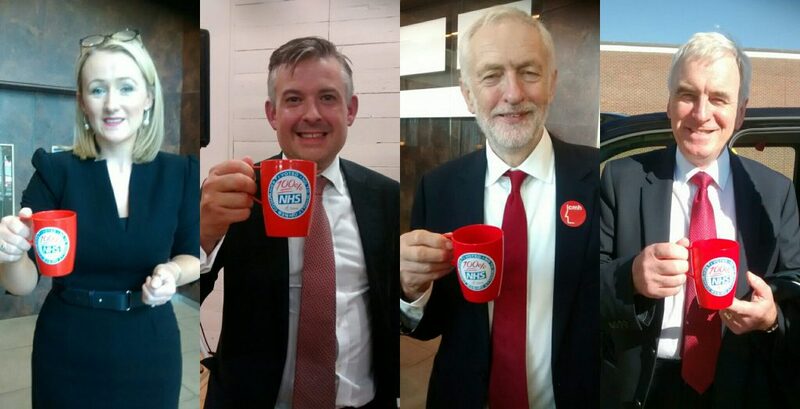 Other leading figures in the Labour party showed their support for East Kent and York Teaching Hospital staff with stickers that read, “100% NHS – I voted no to wholly owned companies.” Pictured below from left to right are shadow business secretary Rebecca Long-Bailey, shadow health secretary Jon Ashworth, Labour leader Jeremy Corbyn and shadow chancellor John McDonnell.